Mac and cheese: the epitome of comfort food. Mac and cheese is one of my favorite foods. Its warm, comforting, full bodied flavor can't be denied. It can only get better by adding bacon and vegetables.The bread crumbs create textural juxtaposition and create a delightful crust. 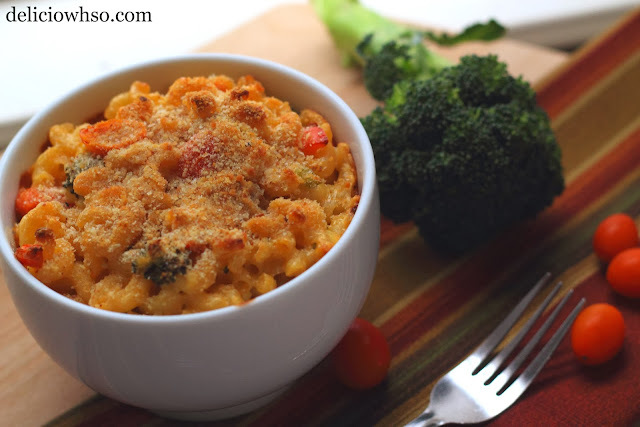 Homemade mac and cheese creates a story filled with comfort, encouragement, and love. It's a symphony of effort and generosity. The richness of each cheesy mouthful resonates in the soul. There's so much value in each bite of a well-made mac and cheese. This recipe is delicious and simple. As daunting as making a cheese sauce can seem, it's easy and quick! 1. Heat milk and butter in a medium-sized pot. Do not boil. 2. When scalding, add flour at once. Whisk until smooth and thickened. There may be chunks. Mix thoroughly and break up the chunks as much as possible. Do not worry too much about what is left. 3. Remove from heat and whisk in cheese and seasoning. 4. Pour the cheese sauce through a sieve, into a bowl. 5. Boil water for macaroni. Season and add oil to water, if desired. Cook macaroni al dente. 6. Strain noodles and run under cold water to stop the cooking. 7. While you wait for the noodles to cook, cut tomatoes into quarters. Cut the florets off the crown of broccoli. Cut corn off the cob. Small dice the pepper as well as the mushrooms. 8. Lastly, cut the bacon into small pieces. I like to cut meat last because it prevents the cross-contamination. 9. In a large pot, cook bacon. Add the vegetables after the bacon has cooked through. Season with salt and pepper. 10. Add noodles once the vegetables are cooked. 11. Mix thoroughly so the vegetables are spread throughout the noodles. 12. Add sauce and mix until well incorporated. 13. Place into a 9x13" casserole dish. Sprinkle the top with bread crumbs. 14. Put in the oven on a high broil for 5-7 minutes, until the bread crumbs are toasted. 15. Remove from oven and enjoy while it's hot. Watch this video! Eat with your eyes! And then make some and eat with your mouth!